Exceptional Mediocrity: Ronald McDonald: Public Menace? Recently a campaign was launched against Ronald McDonald by watchdog organization Corporate Accountability International. The group, which successfully deep-sixed Joe Camel in the 90’s, has announced that the iconic (and slightly creepy) clown “has hooked kids on unhealthy foods spurring a deadly epidemic of diet-related diseases.” They maintain that the McDonald’s mascot bears some of the responsibility for the epidemic of obese American children and want the culinary debauchery to stop. They are staging demonstrations in front of McDonald’s locations all over the country in an effort to pressure the chain to get rid of their spokesman for good. McDonald’s has issued a statement defending Ronald as “a beloved brand ambassador for McDonald's” and unapologetically refused to comply with the group’s demands. In a similar move, Californian lawmaker Ken Yeager has proposed a bill that would prevent fast food chains in his region from providing toys with their kid’s meals. He feels that the move could help stem the tide of obese children because “ten out of 12 meals that are associated with the promotional toys are the high-caloric, high-fat and high-sodium meals.” Shockingly, the California restaurant associated does not feel that this is a prudent step. · I am not sure how many children are that enticed by Ronald McDonald. He looks like a bi-polar clown wearing a highway worker’s onesie. Put a butcher knife in his hand, dim the lighting and you have an image frightening enough to cause Mayor McCheese to drop a cheddar cube. · As McDonalds does not perform home delivery, someone has to obtain said food for the children. Common sense would tell you that a steady diet of McRibs might not be the most nutritious meal-plan for your growing offspring but we cannot force people to avoid a McCoronary. · I am also not convinced that an inexpensive plastic choking hazard is going to tip the scales one way or the other. When I was a kid the bank teller always gave me a sucker when my parents brought me in, but I doubt this incentive convinced my parents to make more deposits. They chose and patronized the bank for their own reasons and the candy was just a bonus. In the end, a child’s diet outside of school is wholly at the discretion of their guardian, parent, or caretaker. People go to McDonalds because it is fast, cheap, and delivers enough artery devastating calories to quell your hunger for long periods of time. 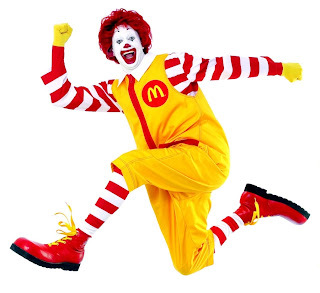 Corporate responsibility is a necessary component of a capitalistic society, but unless the toys are covered in arsenic or Ronald starts dropping F-bombs at Timmy’s birthday party, I am not sure lawmaker should step in. I agree whole-heartedly. It has nothing to do with the kids, its the caretaker who continues to go to McDonald's. I was always scared of Ronald anyway, and still am sometimes.